Warrenpoint Town striker Daniel Hughes has signed a two-and-a-half-year deal with Cliftonville and will move to the Reds in January. Hughes has been one of the most highly-rated players in the Irish League for a couple of seasons. The striker agreed his move to the Solitude club after successfully undergoing a medical. Hughes will not be eligible for the New Year's Day fixture at Solitude between Cliftonville and Warrenpoint. His Reds debut could happen eight days later in the Irish Cup fifth-round game against Immaculata. Hughes had a trial at Bolton Wanderers last season and was linked with several Irish Premiership clubs including Cliftonville in the summer before signing a new two-year deal with his local club. Warrenpoint have lost 17 of their 19 Premiership games this season and are currently seven points adrift at the bottom of the table, having played two more games than 11th-placed Carrick Rangers. Hughes, who has been bothered by a leg injury in recent weeks, has scored four goals for Warrenpoint this season. 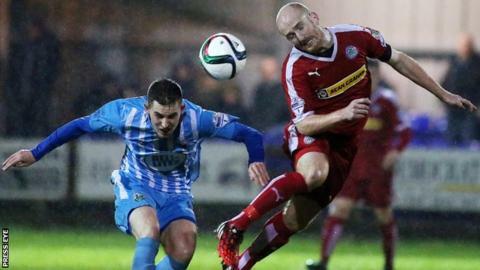 Cliftonville earned a 1-0 victory over Warrenpoint after extra-time in Tuesday's League Cup semi-final.